Fall was in full force as the fans entered Wildcat stadium. They were prepared for foul weather as the sky was threatening rain and getting darker by the minute. The students attending the game dressed in pink to support the Fight against Breast Cancer. Many of the players also showed their support wearing pink socks, gloves, and hand towels as they entered the field prepared to play. 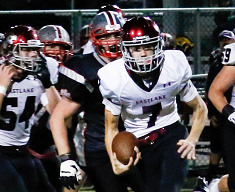 The Eastlake Wolves (ranked 43rd) were eager to restart their win streak against the Mount Si Wildcats (ranked 38th) on this chilly and damp night. The Wildcats’ band revved up their fans as the players lined up and their team kicked off to start the game. 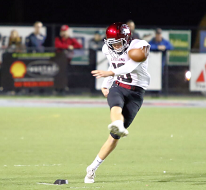 Hunter Klinge received the first of the 16 kick offs that would occur this night and returned it for 20 yards. The Wolves’ quickly showed that they had a strong offensive air attack when Ben Howard (this would be a record setting game for him with 393 yards passing) threw multiple completions. In addition, Chris Nelson had success running with the ball (he would finish the night with 20 carries for 150 yards and 3 rushing TDs). The Wildcat defense toughened up and the Wolves, facing a 4th down and goal, decided to kick a field goal. Taige Thornton drilled it through the uprights giving his team a 3-0 lead. Wolves’ kicker, Austin Berg, who was playing in the first football game of his life, entered the field carrying a football and placed it on the tee. He looked a little awkward and nervous as he gave the signal that he was ready. The referee blew his whistle and Austin kicked the ball down the field. The Wildcat returner caught it and gained about ten yards before being pounced on by several Wolves. 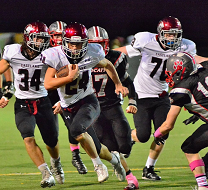 The Wildcats’ drive was short lived but provided a moment of excitement for the Wolves’ fans when Noah Morse (who had a team high 9 tackles this night) stepped between the QB and his targeted pitch man, reached for, grabbed, bobbled, and then dropped a ball that, if secured, would have allowed him to run untouched into the end zone. The Wolves’ fared no better on their next series and soon were forced to punt. The Eastlake fans gasped as they watched the long snap sailing high above Ben Howard’s head and then sighed in relief as he jumped high enough to catch it and get his punt off just in time. 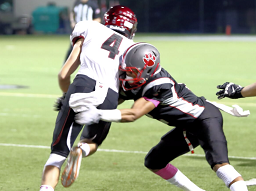 On the next play, Middle Linebacker, Eric Plummer destroyed the Wildcats’ ball carrier with a vicious hit. Mount Si continued to march down the field until Parker Lester broke up two long passes to thwart their progress. The Wolves took over on downs after a failed 4th down attempt. The Wolves’ next drive was no better and they also had to punt. The Wildcats connected on a 52 yard pass reception on the next series but turned the ball over when Colin Booker picked up a fumble. Then Cole Brinkman’s made a 33 yard reception that fired up the Wolves. They moved the ball down the rest of the field and scored on a 1 yard Chris Nelson rush. They were up 10-0 after Taige Thornton kicked the PAT. The Wildcats were stopped again after another 4 play and out series. The Wolves took possession. Hank Pladson (who would end the game with 9 receptions for 116 yards) outran his defender and caught a 30+ yard pass from Ben Howard. Then, after Hunter Klinge caught a 6 yard pass, Chris Nelson took a hand off, sprinted toward the left sideline, and snaked 32 yards through several Wildcat defenders and crossed the end zone for a score. The Wolves were up 17 – 0 after Taige kicked the PAT. 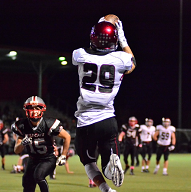 On the next series Mount Si’s offense had a spark and moved the ball down the field. However, Hank Pladson extinguished it when he intercepted a pass and returned it 50 yards before being tackled. The Wolves marched the ball, overcame two penalties, and scored when Ben Howard faked the hand off, tucked the ball under his arm, and scored on an 8 yard QB keeper. The Wolves missed their PAT; score 23-0. The Wildcats received their 4th kick off. It was clear the Wildcat fans didn’t throw in the towel as their loud cheers echoed throughout the stadium as they began their next offensive series. Their young QB showed why he was their starter when he threw a perfect 38 yard bomb to his receiver who caught it and was quickly tackled. The Wolves D reminded the Sophomore QB that he was now playing varsity when Ryan Guptil sprinted through the offensive line and smashed into him just as he launched the ball far over his receivers’ heads and out of the field of play for an incomplete pass. The Wildcats scored on a 16 yard run that put their first points on the board. The Wildcats missed their PAT due to the effective rush of the Wolves’ defenders; the score was 23-6. Parker Lester had a 16 yard pass reception on the next series but the Wolves had to punt due to sloppy play that included two penalties. 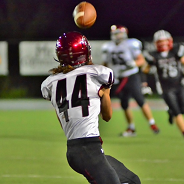 The Wolves’ defense worked hard on the next series that concluded when Parker Lester intercepted a Wildcat pass. The Wolves had several miscues on the next series including two dropped passes and two false start penalties. One negated a 36 yard reception. The Wolves punted the ball back to the Wildcats and gave them 15 additional yards when a Wolves’ player was called for unsportsmanlike conduct at the end of the return. Mount Si took over and managed two plays before the half came to an end; score staying 23-6. Mount Si’s coach must have given a great half time speech as the Wildcats came out fired up for the second half. They received the kickoff, marched down the field, and scored when their receiver caught a 37 yard pass for a Touch Down. The PAT was good; score 23-13. The Wolves started out the half strong as well and marched down the field. Highlights included Hunter Klinge’s 35 yard kick-off return, Parker Lester’s 17 yard pass reception, and a Ben Howard TD on a 1 yard QB keeper. Taige Thornton kicked the PAT; score 30-12. Mount Si put together a string of successful pass plays that brought them to the Wolves’ 2 yard line. Their running back took the ball and ran into the end zone; score 30-20. The Wolves took over with 4:45 left in the third period as the rain began to fall. Eastlake mounted another impressive drive. Highlights included a 29 yard pass reception by Cole Brinkman, and two receptions by Parker Lester. One for 31 yards and a few plays later he caught a 13 yard pass for a Touch Down. After Taige Thornton kicked another PAT, the score was 37-20. 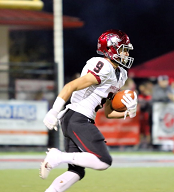 Mount Si showed resolve and their next series had some exciting moments including a 35 yard pass into the end zone that fell incomplete after slipping out of the fingertips of the receiver to end the third quarter. Then after a great tackle for a 3 yard loss by the Wolves’ D-lineman Ryan Guptil, the Wildcats completed a 38 yard pass for a touchdown. Their PAT was good; score 37-26. Then Mount Si recovered an onside kick and their fans went crazy. Their excitement was short lived as the Wildcats had to punt. The Wolves mounted another successful drive in which Hank Pladson caught a 6 yard pass in the end zone for a score. Taige Thornton kicked the PAT; score 27-44. The Wildcats kept themselves in the game when, on the next series, their receiver had a change in luck when he stretched out for and caught a 59 yard TD reception with his fingertips. The PAT was good; score 44-34. The Wolves next drive included a quick hitch pass that Hank Pladson caught and then pounded through the Defensive backfield carrying many defenders for an additional 10 yard gain. The other top play involved a 55 yard run by Chris Nelson that ended with him and his teammates celebrating in the end zone. That TD and the extra point kick by Thornton put the Wolves up by 17; score 51-34. Mount Si had to do something fast to stay in the game, but any chance of a comeback faded when Parker Lester made his second interception of the evening and returned it 15 yards. The Wolves quickly marched down the field. Chris Nelson had a 7 yard rushing gain. Then Hank Pladson made a 17 yard reception. On the next play, Chris Nelson outran his defenders, Ben Howard through a perfect pass, and he caught for a 38 yard reception for a Touch Down. Taig Thornton kicked another PAT. His tenth point of the game put the Wolves up 58-34 with a minute fifteen seconds left in the game. Mount Si ran a few plays to run out the clock and the Wolves celebrated their 4th win of the season. 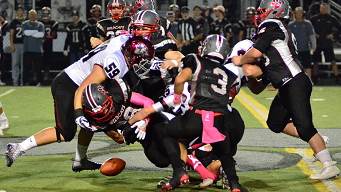 The path to the playoffs continues when the Wolves take on the Newport Knights next Friday at the Knights stadium! We expect the Knights to put it all on the line as they seek their 2nd victory of the season. Thanks to Pat Howard for keeping statistics and to Messrs. Cardwell, Mohrhardt, and Bradley for providing excellent photos.